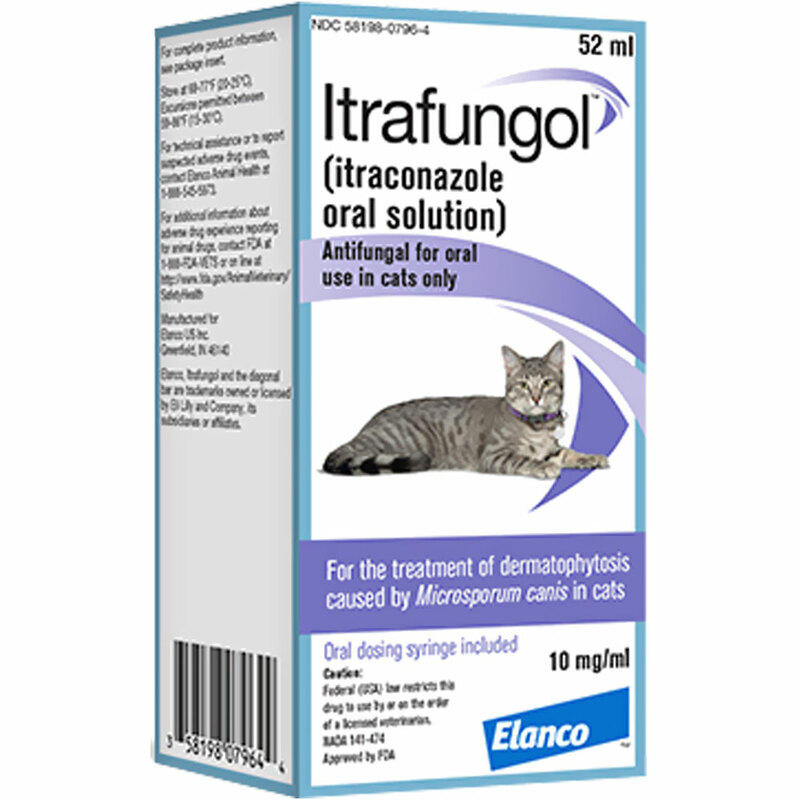 Itrafungol (Itraconazole Oral Solution) is used to treat ringworm in cats caused by fungus infection. Cats with ringworm typically have patches of hair loss, scaling, crusting, and redness, with or without itchiness. Most skin lesions are found around the ears and face or on the legs. The disease is most commonly seen in kittens. Itrafungol is a cost-effective, cherry caramel-flavored liquid that is easy to dose and easy to administer. It requires a short course of pulse therapy oral dosing on alternate weeks for three treatment cycles. On the day I was calling the vet to make the appointment for the kittens spay/neuters, I found the white crusty area on one of the boys' ears...then another red crusty area above the eye on one of the girls. Where the heck did they come from? They weren't there last night. Having seen enough ringworm, I was pretty sure I was looking at it again. I immediately went to the supply box and got the miconazole nitrate cream. For those who are unfamiliar with this product or why/how it is used, it is found in the feminine product aisle, normally used for vaginal yeast infections. it is much less expensive than anything by prescription. I have also used a product given for jock itch which worked pretty well. However, DO NOT use internally with the kittens, just apply to the affected areas. I do it 3 times a day. I also use the Itrafungol Oral Solution in conjunction with the cream. My vet said to use it for three weeks with no breaks. The directions on the bottle say to use for 1 week on, 1 week off, for three cycles. I gave it to them for the 3 weeks, took off a week, then 1 more week on. I was so sick that these kittens had gotten the ringworm, which delayed their going to their forever homes for ever a month, that I wanted it gone quickly. 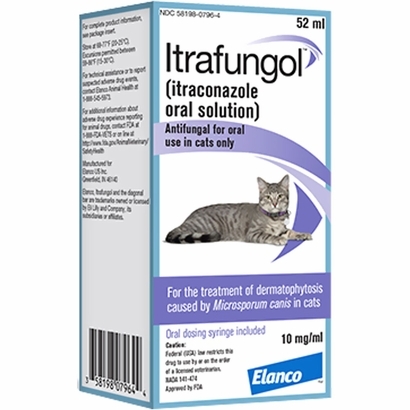 I believe that the Itrafungol Oral Solution worked wonderfully, in conjunction with the cream, in getting rid of the ringworm. All 8 kittens were clear of any symptoms, hair growing back on affected areas, within 3 weeks. I probably would not have had to treat that last week, however, I did not want to take any chances, especially with them going to their forever homes. This bout of ringworm was cleared up 3 weeks faster than my other 2 experiences with it. I do, however, believe it should be used in conjunction with the miconazole cream for the best results. Hopefully, I will never have to use the product again, but I wouldn't hesitate if needed and would gladly recommend it to others. Thank you for a wonderful product to treat ringworm.